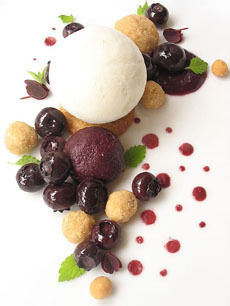 Deconstructed blueberry pie à la mode. Photo courtesy Linda Anctil. We are huge fans of Linda Anctil, a Connecticut-based chef and caterer whose blog, PlayingWithFireAndWater.com, makes us want to show up at meal time and befriend her. She’s a great deconstructionist chef and caterer, and it’s a pleasure to look at her concepts and photos. You can see the full recipe here. It requires professional skills and equipment. But you can make an easy version even if your main skills are simply gathering and assembling. April 28th is National Blueberry Pie Day. See all the other food holidays. Hack: Use crumbled shortbread or graham cracker cookies instead of the pie crust. Pre-scoop the small balls of sorbet and larger balls of frozen yogurt or ice cream and place them on a cookie sheet in the freezer for quick assembly. To assemble, follow Linda’s photo, above. 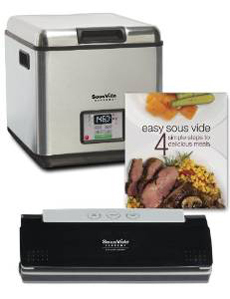 Sous vide, pronounced soo-VEED and meaning “under vacuum,” is a cooking technique developed in France in the 1980s. Since then, it has been used by the greatest chefs to assure consistency in turning out fine meals. Portions are prepared in individual, sealed plastic bags that are cooked in a water bath. Previously only available for the professional kitchen, a consumer model debuted in 2009. It’s for the serious cook. Once you get the hang of it, it makes cooking easier. Whether for entertaining or for family meals you can prepare the food to precisely the temperature you want (no more meat thermometers!) in a fraction of the time. If you’re cooking multiple portions of temperature-sensitive foods for a dinner party—fish or steak, for example—sous vide ensures that every piece is cooked exactly the same. You can prepare in advance, partially cook the food in the individual portion bags, and then finish the cooking in minutes. The individual sealed bags make plating and clean-up easy. Here’s more about sous vide cooking. Sous Vide enables adventurous cooks to use an alternative cooking technique. Photo courtesy Sous Vide. Highbush blueberries (Vaccinium corymbosum) grow on tall bushes; some cultivars reach a height of 6 to 8 feet. The berries are larger and more abundant than lowbush blueberries, although their flavor may be somewhat less intense and sweet. Lowbush blueberries (Vaccinium angustifolium), also referred to as wild blueberries, grow in Maine and the colder regions of eastern North America. The shrubs grow no taller than two feet and may be smaller, depending on soil and climate, and produce small, exceptionally sweet bluish-black berries. If you want to plant a bush or two, these are hardy plants that do well in all soils, even poor, rocky types, providing the drainage is good. Michigan is the leader in highbush blueberry production. An old statistic in Wikipedia credits Michigan farms with producing 220,000 tonnes (490,000,000 pounds) of blueberries, accounting for 32% of those eaten in the United States. Other states with substantial commercial acreage of highbush blueberries are New Jersey, Florida, Georgia and North Carolina. Maine produces 25% of all lowbush blueberries in North America with 24,291 hectares (60,020 acres) under cultivation. The wild blueberry is the official fruit of Maine. Georgia, with about 10% of production (that’s 77 million pounds), has the longest harvest season in the U.S., lasting from late April through the end of July. Hammonton, New Jersey claims to be the “Blueberry Capital of the World,” growing more than 80% of New Jersey’s blueberries.